Blissbook’s new payment system scales with you as you grow (or shrink). You only pay for what you use. You don’t pay for people who separated from your company or for people who’ve yet to join. You don’t have to change something every time you make a hire and you don’t have to be clairvoyant about how many employees you’ll have in the future. Everything just works, automatically. Going forward, all subscriptions will be based on Credits. You pre-purchase Credits and they’re deducted every day your account is active based on how many Users have access to your handbook(s). When you run out of Credits, more are purchased automatically. 1 Credit = use of Blissbook by 1 user for 1 day. All current Blissbook subscription holders will be migrated to the new system. We’ll seed your organization with the Credits required to carry you through to your renewal date. If you have fewer than 170 employees, you’ll be saving some money. Other than that, your pricing is the same as before. Once the new system is deployed, all your billing details will be available on your new billing page. 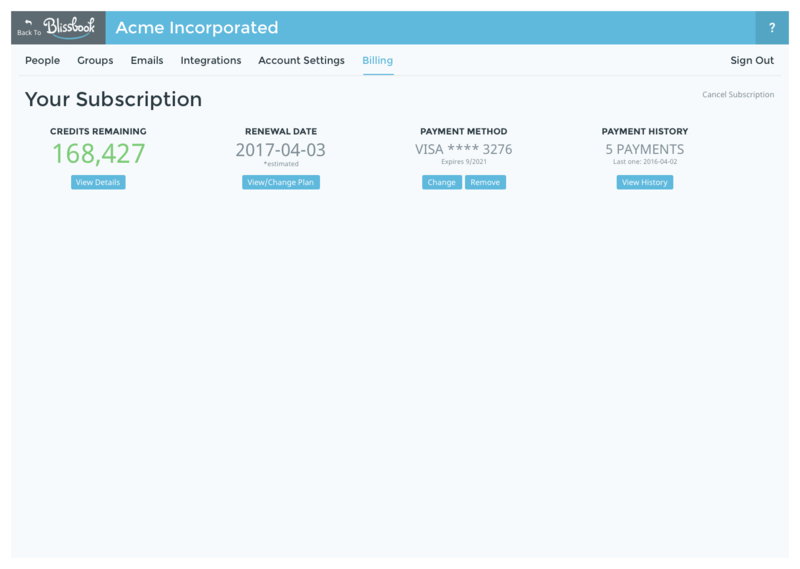 You’ll be able to see a ledger and history of your Credits, change the credit card on file, view invoices, and more. If you have any questions, our support team is here to help.